In September 2016, The Canadian Cancer Society-Nova Scotia Division celebrated the completion of a $15 million campaign and the expansion of The Dr Susan K. Roberts Lodge That Gives with the announcement of a new name —The Sobey Cancer Support Centre. The name is a nod to the incredible generosity and contributions of the Sobey family who provided resources, funds and leadership throughout the campaign. Marsha Sobey, Chair of the Daffodil Place Campaign, also served as the Chair of Leadership Gifts and donated a multi-million dollar gift that included a project management team from Sobeys onsite throughout the construction. In recognition of these significant contributions of the Sobey family, the Canadian Cancer Society has named the newly expanded building The Sobey Cancer Support Centre. The Sobey Cancer Support Centre is comprised of The Dr. Susan K. Roberts Lodge That Gives, The Steve and Kathy Smith Programming and Wellness Area and the Offices of the Canadian Cancer Society-Nova Scotia. In memory of Dr. Susan K. Roberts, The Lodge That Gives is now known as The Dr Susan K. Roberts Lodge That Gives. Dr. Roberts, a long-standing and beloved Halifax-area dentist, who left a generous legacy gift to The Lodge. After leading a life of generosity and care, this dedication means Dr. Roberts can continue making a difference for those who need comfort during their cancer treatment. The Dr. Susan K. Roberts Lodge That Gives is comprised of two floors of accommodations in addition to the original main floor. There are 32 bedrooms in total with a shared laundry, linen room, and a TV room, and reading area on each floor. Steve and Kathy Smith were early supporters of the Campaign and provided a generous gift which helped expand programming and services offered to guests. The Lodge holds special meaning for Steve who, for many years has supported many different cancer initiatives. The Lodge is primarily used by cancer patients from the rural areas of Nova Scotia where our Central Supplies stores have been located. Supporting the Lodge which has done so much for rural Nova Scotians who must travel to Halifax for treatments, is a way that we can give back to our friends, customers and communities." says Steve. The Steve and Kathy Smith Programming and Wellness Area includes rooms for activities such as yoga and Reiki, a multi-purpose room for games or meetings, an exercise room, quiet or meditation rooms, an expanded wig and breast prosthesis fitting room, a TV room and a computer area. “The Lodge” as it is affectionately known, is a residence style accommodation that is considered like a “home-away-from-home” for cancer patients who must travel more than 50kms to Halifax for cancer treatment. The Lodge can sleep up to 64 guests. While many who stay at The Lodge love the well-appointed and clean rooms as well as home-cooked meals, it is often the supportive and family-like atmosphere that guests cherish most. Something as simple as a cup of tea or a game of cards with the other guests can offer invaluable comfort and friendship during a challenging time. Bedrooms are shared with one other guest unless you come with a companion. Among our rooms we have two accessible rooms, two family rooms and two single rooms which accommodate those who must travel with a service animal or have unique needs. Each floor includes a laundry room, reading room and a shared TV room. The deck offers a quiet spot to reflect or enjoy the fresh air and is a favourite warm weather gathering space. In the evening there are walks throughout the neighborhood or to the waterfront organized by volunteers. Volunteers, who often have a connection to cancer, can offer an amazing amount of support and comfort. This area of The Sobey Cancer Support Centre offers enhanced and expanded supportive care and programs. There are additional common spaces in which to gather with fellow Lodge guests. Guests who are staying at The Lodge can enjoy the multi-purpose space to join in a board game or finish off a puzzle, watch television in the shared TV room, or check email in the computer area. Wi-Fi is provided free of charge so guests can connect with loved ones online at any time. The Programming and Wellness Area offers a variety of programs and services for guests and their companions. Not only are our services available to guests who are staying at The Lodge, but The Sobey Cancer Support Centre welcomes patients and their families who may be at the hospital for day treatments. During consultation with patients and health professionals, we uncovered an unmet need. Often patients can spend several hours sitting in hospital waiting rooms, perhaps between appointments and treatments, or waiting for someone to pick them up. 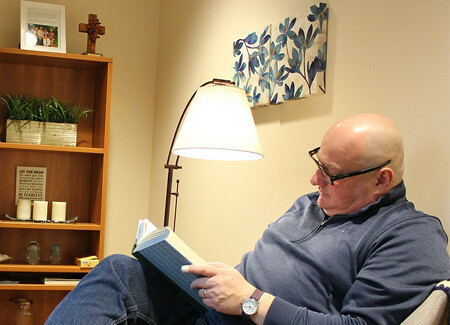 Guests can join us for a few hours in our Respite Room to relax, watch television or read a book and have a cup of tea. Patients and families of the Cancer Centre may also join us for a nutritious and affordable meal in our Lodge Dining Room. Reservations must be made by calling ahead at 902-420-1849.